Hudson Valley Ramble - all weekends in September? Booth at Yorktown Street Fair? Manager's Minute - Bob Guarino, Park Manager reported that the State is installing solar panels to power the filter room. A regional crew will install them. He needs a part time employee on weekends to be at the boat rental; must be 16. the sign advertising the nees for life guards has been effective. The truck that is used to spread salt is back in service and when the salt spreader is empty, it will be moved from the dump truck. The First Day Hike continues to be popular. Thirty people attended on the hike out to the long bridge. An event that is advertised as part of a larger event always attracts folks from outside this area. The map brochures have been printed and are not in the office. They will be places in the holders purchased to hold the rack card about the Friends. A big thanks to Susan Wagner for piloting this project funded by PBSC's community grants. Once Mark Kotkin has the information he needs about acceptable wildflower seeds to buy, he will talk with Bob Guarino about the amount park personnel can reasonably plant in the spring.. Thanks to the office for selling the FDR hats. Charlie Castronova reported that we have sold 51 hats. It appears that a pedestrian signal at Route 202 and Strang Boulevard will become a reality. It was planned as part of the Route 202 and Taconic interchange improvements because of the consturtion of Lowes. Charlie checked out the prices for wind panels for Pavilion 1, which must be able to be rolled up until needed for a function. Four are needed. Anwer Qureishi (on the phone) had sent Jane a proposal about a quarterly newsletter that will be about the park users. Possible content includes president message, historical trivia, calendar of events, meeting schedule, volunteer of the quarter, park manager's message ( upcoming enhancements), overview of organizations we partner with or are regular park users. He stressed that it needs to be a cooperative effort. 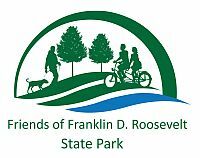 Dianne Press will talk with Rick Fisher about applying for anotherr grant to add Interpretive signs. Invasive Removal - David Merle had contacted Bob Guaruno about invasive vine removal. Dave had been part of the Vine Cutters along the Bronx River and only cuts bittersweet or porcelin berry. He would like to set up a similar crew for the park. Jane suggested that he set two meetings per month, one Saturday, one Sunday. Dianne suggested that he talk to Susan Wagner about designing a poster advertising the events. Dianne will be away in June and unless someone else wants to coordinate a bird walk with Bedford Audubon, it won't happen. Dianne was not available for the Path Through History Hike on Father's Day Weekend or Columbus Day Weekend. She will run a history hike one of the weekends in September as part of the Hudson River Valley Ramble. A decision will be made later about having a booth at Yorktown Street Fair.